All depends on you and because of that you got to be full prepared for the battle that comes along in this medieval game. Take a deep breath and over think the situation in a way that will bring you the crush of the castle. A whole kingdom must be dethroned and you're the only one that remains to get this job done. Use your boulders launcher to throw and tear apart each tower from any proposed level. Discover the perfect angle and redirect the launch before you throw your munition. Don't waste your shots because you have just a few and you have to handle those prisoners with what you've got. Kill them using a special shot that would crush the castle from the ground or find an ingenious technique to defeat your enemies. Once you advance the armory is going to diversify and you'll be able to throw many rocks that will make your task a little bit easier. 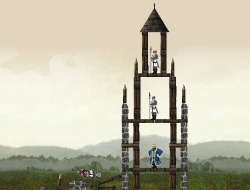 Accomplish the required missions and crush the builded castles. Crush the castle 0.00 between 0 and 10 based on 0 votes.